FREMONT, OH. (Saturday, April 13, 2019) – While everyone else went to the bottom of the track, Republic, Ohio’s Cap Henry decided to go to the top at Fremont Speedway Saturday night and it paid off. Henry drove to the 410 sprint win to open the season at “The Track That Action Built,” his seventh career victory at the speedway on Union Trades Night. “Nate (Dussel) and Justin (Peck) were driving away from me…I’m not a points racer and I just wanted to win so it was time to move and see if we could figure something else up. I have to talk to my new crew chief Zack. He was giving me hand signals and I don’t have a clue what they mean,” Henry said beside his Beer Barrel Bourbon, Pro Auto Wraps, Wings Unlimited FK Rod Ends, Lead Head Waterfowl backed machine. The cautions fell perfectly for Henry, keeping him out of lapped traffic. “I got nervous there that last run when we were catching traffic. I knew I could maintain what I was doing but I didn’t know what I could do when I got to traffic,” he added. It was the second event of the newly created Kistler Racing Products/All Pro Aluminum Heads Attica Fremont Championship Series (AFCS) Presented by the Baumann Auto Group. The AFCS has a hefty point fund for both the 410s and 305 sprints separate from both Attica Raceway Park and Fremont Speedway. Last year Tyler Street from Fredericktown, Ohio, scored his first ever sprint car win. 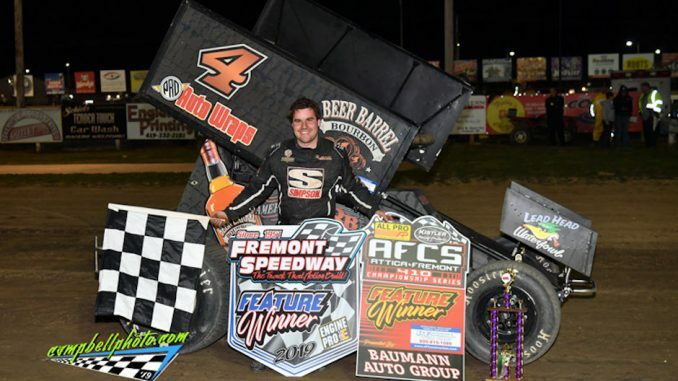 He wasted little time in 2019 adding to that total, claiming his first ever Fremont Speedway win in the Fremont Federal Credit Union Sprints. It wasn’t easy for Street, who nearly slid off the high side of the track in turn three with two laps to go. “I over drove it and hit a rut in turn three and I really thought I was going over the banking and into the wall. I knew I was going to hear it from dad afterwards so I calmed myself down and finish off these last couple of laps. This is one of my favorite tracks and I’m glad to finally get a win here. I want to thank my mom and dad, Hannah and everyone who works on this car. My family came tonight so it was awesome,” said Street beside his Steve Browns B&B Drain Service, MLTW Machine & Tool, Griff’s Engines, Radio Pulse, Schaeffers Oil, Innovative Graphics, Truform Eyewear and Vantage Athletic backed #4*. It was also the second event for the new 305 KS Sales & Service AFCS Presented by Jason Dietsch Trailer Sales. “It’s really cool what they are doing with this AFCS for us…giving us a chance to make some extra money and keep us racing,” Street said. Fostoria, Ohio’s Shawn Valenti picked up where he left off last season – winning features in the Burmeister Trophy Dirt Trucks. Valenti took the lead at the half way point of the feature and drove to his 47th career Fremont win, placing him in a tie for seventh on the track’s all-time win list. “Jimmy (McGrath Jr.) was rolling pretty good in that truck. Track was a little different than what we’ve been used to the past few years but it made for some exciting racing,” Valenti said beside his Babcock owned, Best Performance Motorsports, A Plus Auto Center, Craig Miller Trucking, KS Sales & Service, Gressman Powersports backed #7B. Justin Peck and Nate Dussel brought the field to green for the 30-lap Fort Ball Pizza Palace 410 Sprint feature with Peck gaining the advantage. Dussel ran comfortably in second with Henry holding off Hunter Schuerenberg, Buddy Kofoid, fast qualifier Parker Price-Miller and Lee Jacobs. While most ran the bottom, Jacobs quickly moved his wing back and drove to the middle of the track and soon was fourth challenging Henry. DJ Foos spun on lap eight with Peck still leading Dussel, Henry, Jacobs, Schuerenberg and Price-Miller. On the restart Henry was able to get around Dussel and closed quickly on Peck just as the caution flew for a Broc Martin spin. When the green flew Henry drove to Peck’s outside as the pair battle for two laps before Henry was able to take the top spot on lap 14. At the halfway point it was Henry leading Peck, Jacobs, Dussel, Schuerenberg, Price-Miller and Kofoid. As Henry pulled away slightly Jacobs and Peck battled hard for second with Dussel holding off Price-Miller, Schuerenberg and Brian Smith who had charged from 12th. Brandon Wimmer clipped an infield tire to bring out the caution with nine laps to go. With a clear track Henry was able to pull away as Peck and Jacobs continued to battle for second. Jacobs executed a slider in turns three and four with five laps to go to take the second spot and started to track down Henry. Henry was able to maintain his line and drove to the win over Jacobs, Peck, Price-Miller, Dussel and Smith. Street and Brandon Moore led the field to green for the 305 A-main with Moore taking the lead over Street, Jason Keckler, Paul Weaver, Jamie Miller, Luke Griffith and John Ivy. With six laps scored, Street had closed on Moore with Miller taking third. Street drove into the lead on lap nine and immediately into heavy lapped traffic. The first caution flew on lap 14 when Larry Kingseed Jr. spun with Street leading Moore, Miller, Keckler, Ivy, Weaver, Griffith and Bobby Clark who had charged up from his 14th starting spot. On the restart Miller took second and stayed within striking distance of Street. With three laps to go Miller was right on Street’s rear bumper when the leader bobbled in turn three. Miller couldn’t pounce and Street drove away to the win over Miller, Moore, Ivy and Clark. Jimmy McGrath Jr. took the early lead in the 20-lap dirt truck feature while second was a war between Andy Keegan, Jim McGrath, Paul Brown Jr., Keith Sorg, Valenti and Dustin Keegan. The first of several early race cautions flew on lap five for a Steve Endicott spin. The truck on the move was Valenti who charged into second on the restart. A caution on lap eight for Brad Mitten followed by another on the restart involving Sorg and Cory McCaughey slowed the pace. A lap later and multi-truck crash brought out the yellow again a lap after Valenti had taken the lead. The final caution flew on lap 11 with Valenti leading McGrath Jr., Brown, Andy Keegan, McGrath Sr., Eric Devanna and Dustin Keegan. Valenti couldn’t shake McGrath Jr. who stayed glued to the leader’s rear bumper. Valenti never made a mistake and drove to the win over McGrath Jr., Dustin Keegan, Andy Keegan and Brown. Fremont Speedway will be back in action Saturday, April 27 on Level Performance/Gressman Powersports Fan Favorite Night with the 410 and 305 sprints and dirt trucks in action.